A working interactive softgood built with the purpose of bringing physical interactions back into long distance relationships. After receiving feedback from 100 members of our community about how distance effects their relationships, we recognized the common themes that digital interactions lacked meaningful interactions, engagement of the senses, and spontaneity. We wanted to design a softgood that provided a more loving and comforting experience than screens do. Originally tasked with the goal to make a softgood that inspired 'play', I challenged the team to think about the ways adults, not just children, experience play in their lives. Together, we decided to focus on the relationship space, specifically, "how do adults create joy and playfulness in long distance relationships?" 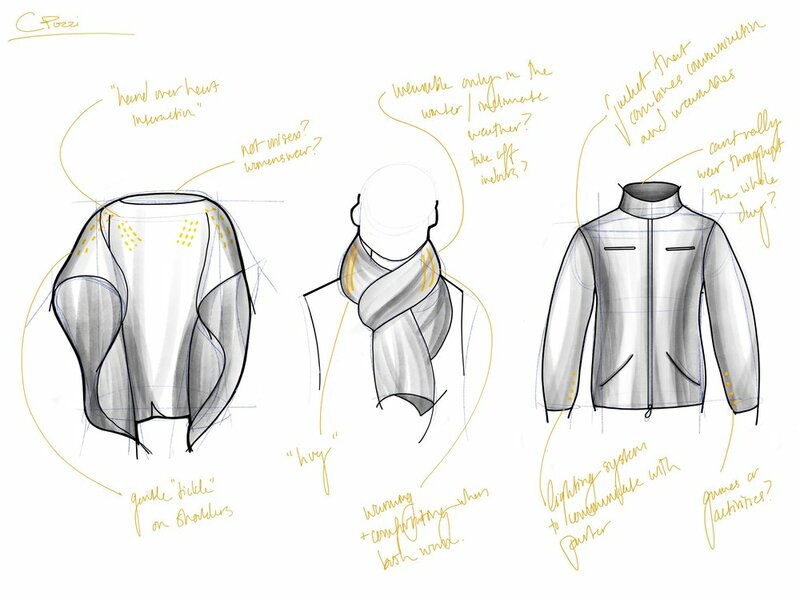 Created alongside two other industrial designers passionate about relationships in a digital age, we built our garment to bring back the warm interactions and physical touches indicative of being with a loved one. I was instrumental to the concept of Koselig by leading initial team discussions, conducting interviews, creating surveys, and speaking to other designers focused on this similar problem-space. Additionally, I helped prototype the koselig garment, create the 2D deliverables (including all photography and video), and direct the overall style and look. Built as a set of two, Koselig's users can send their lover's paired garment a "nudge” (a small vibration sent to the shoulder of their partner’s garment) by placing their hand over their heart, or initiate a phone call in a more intimate environment by interacting with the hood. The sensation of comfort and inner warmth you feel when returning to a familiar place; the tranquility of sitting with friends around a campfire; the overwhelming happiness you feel when you embrace a loved one. We asked one hundred members of our community to talk about their long distance relationships (both friendships and romantic partnerships) in order to figure out the most frequent and emotionally taxing pain-points. How would you describe most of your relationships? What kind of activities strengthen your friendships/relationships? How do you keep in contact with these people? We interviewed our friends, family, strangers, each other, and the people we loved most about what it means to have a relationship affected by distance. What do you miss the most about being with your friends and loved ones when you are apart? 5-Senses. Most of what people talked about in regards to missing someone involved the 5 senses, specifically those that do not translate digitally (smell, touch, taste). Communication Delays. The ability to 'live in the moment' and react to things in real-time helped foster and build a sense of connection for most-- without this, people felt like could "only share the important things" and that there was a lot of joy lost. Shared Activities. Almost always included in our discussions was the loss of being able to share an activity (meal, experience, place, ect) that comes with distance. I spoke with Faryal Khalid, a masters student focusing on long distance relationships for her thesis. Her insights and findings through user research allowed us a more in-depth access into this problem space. Interruption Anxiety. Couples spoke about having the freedom and means to contact their partners, but not wanting to out of fear they might be interrupting them. Scheduled Spontaneity. Most people who spoke on the phone, skyped, or engaged in any form of lengthy conversations regularly scheduled these events. It was during this time where people felt comfortable to share a common activity together such as cooking dinner or watching a TV show. Reciprocation Guilt. There was a strong sense of guilt attached to not responding to a love one that has contacted you -- even if their message said "no need to respond". This effect worked both ways, as people sometimes identified they were concerned their attempts to message a loved one might actually create burden because of the needed perception to respond. Appropriate Involvement. Couples, in particular, felt strongly about being 'appropriately involved' in their significant other's day-to-day actions. One discovery by Faryal involved participants of her research study strongly opposing being able to access a camera/footage of their significant other at home, but liking the idea of a lighting system that alerted them what room of the house their significant other was in. We took our research and divided it up by common themes and reoccurring questions. 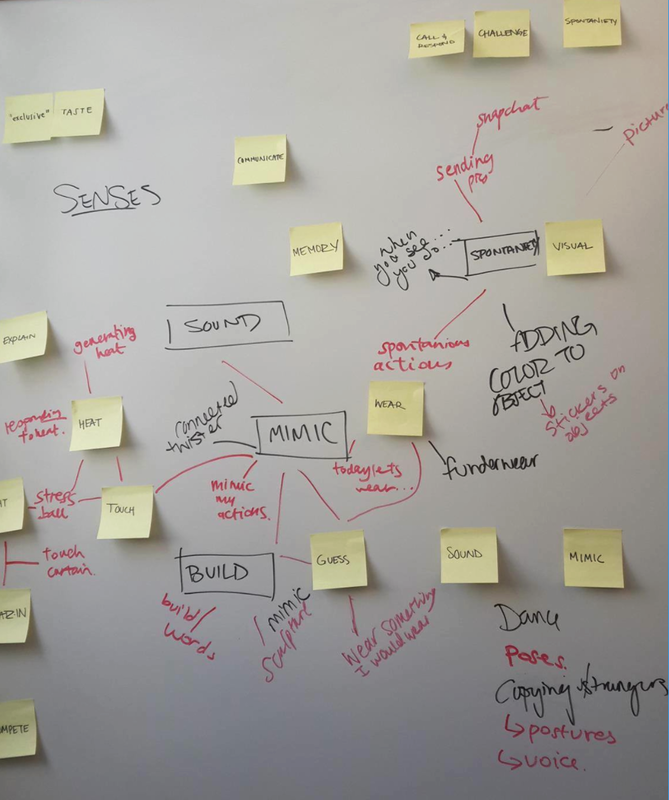 We positioned our pain-points alongside the materials and interactions we could use to brainstorm a solution for the physical space. Combining the possibilites for our softgood with our desired objectives allowed us to rapidly brainstorm ideas. We explored and further developed the ideas with validity into initial concepts. We presented initial concepts to our industrial design class. Our professor and peers encouraged us to imagine an object that both reflected a partner's mood/status and also featured a playful interaction. Further considering the interactions between the user and the product, we redrafted our initial ideas into further developed concepts. We combined the interactions and forms into a unisex, modern garment that features physical engagement as a method to communicate with loved ones.